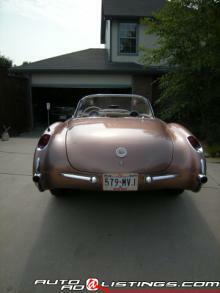 1956 Restored Corvette Classic214W..1956 Corvette Convertible two tops 265-210 hp 3 speed. Aztec Copper paint with Beige coves Shoreline Beige interior and Beige soft top One of only 402 produced. Body off restored interior top chrome stainless and exhaust. Also has stainless exhaust fuel lines brake lines and rebuilt motor and transmission about 400 miles ago. Optioned with auxiliary hardtop 3.36 rear e-brake warning light stainless exhaust windshield washers courtesy lights heater seat belts hubcaps and 6.70x15 wide white tires. Most all factory correct components including Wonderbar radio speaker the spare jack jack tools trunk mat trunk liner rebound straps spiral shocks washer system shifter shielding air cleaner generator owners manual sales brochure and the one year only 1956 hardtop. Documented with restoration and maintenance receipts Original restoration file to the tune of 35 000.00 back to 1966. Current restoration additional aprox. 12 500. Looks runs and drives excellent.